Did you know that you spend around a third of your life asleep? Therefore, it makes sense that you’d want to spend all that time snuggled up in the best duvet available. After all, while a great mattress is essential for joint and muscle support, and fluffy pillows are great for keeping you cosy all night long, there’s nothing like a quality duvet to keep you in dreamland on those cold winter nights. The trouble is, most people have no idea how to choose a duvet that suits their individual needs. After all, there are so many different products, togs, fillings, and other components to think about. What’s more, while you might be able to test out a mattress at your local bed store, it’s not as easy to ask a store clerk whether you can try wrapping yourself up in one of their duvets for half an hour. The good news is that we’re here to help you make the best decisions for your bed. Our expert advice and duvet buying guide will tell you everything you need to know about choosing the ultimate covering for a good night’s sleep. There’s something ultra luxurious about the idea of wrapping yourself up in goose down at night. 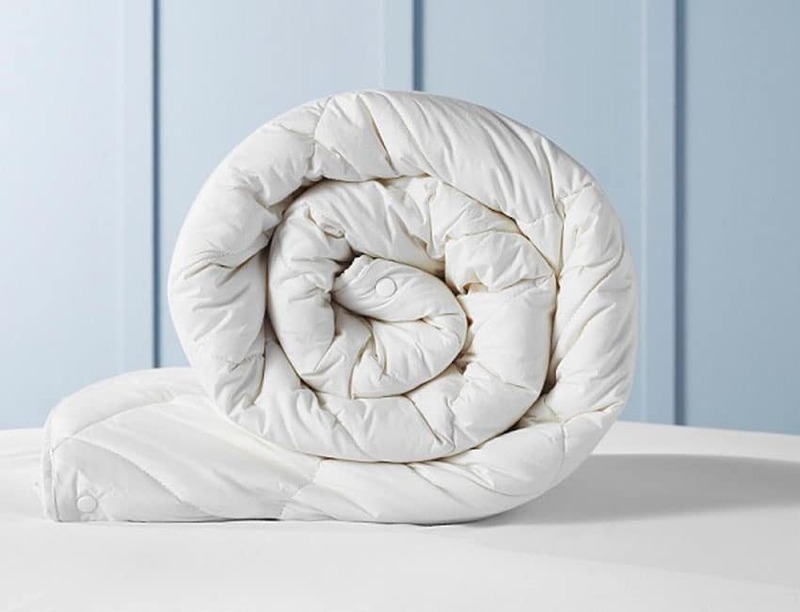 The Hungarian goose down duvet from The White Company is a 10.5 tog solution filled with 20% plump goose feather and 80% wonderfully soft goose down. The combination of down and feather makes the duvet feel extra light when you’re sleeping, so you’re less likely to feel weighed down during the night. Since part of choosing the right option is finding the best duvet filling, it’s safe to say you can’t go wrong with goose down. 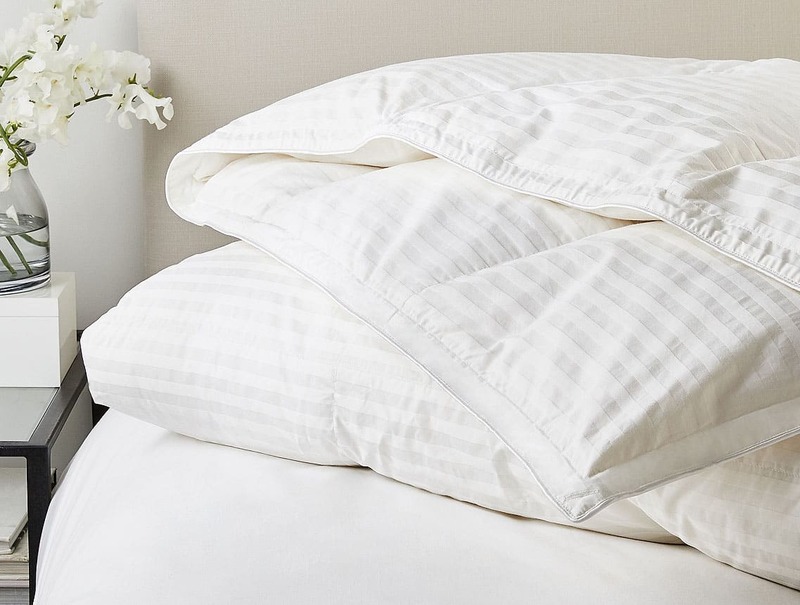 What’s more, the White Company duvet is covered in a 329 thread count cotton coating too, so even if you don’t have a duvet cover on, you’re sure to feel ultra-cosy. If you’re looking for a light and breathable duvet that can keep you warm in any season, then this could be the ultimate option for you. The goose down naturally wicks away sweat and allows your skin to breathe during the night, so you’re not continually tossing and turning to try and get comfortable. What’s more, the Hungarian Goose Duvet won the award for the number one best duvet in 2017 according to the Independent newspaper. There’s more to finding the ultimate cover than browsing through the best duvets reviews online. You also need to know precisely what “tog” level is right for you. The John Lewis & Partners Natural Collection Hungarian Goose Down Duvet combines a 4.5 tog cover with a 9-tog cover to give you plenty of warmth in the winter months. Designed for those ever-unpredictable cold British winters, this duvet is made using Hungarian goose down. Since Hungarian geese need to live in one of the coldest parts of Europe, you can rest assured that their down will keep you cosy at any time of the year. Additionally, the feathers and down are divided into 3D pockets, so you don’t have to worry about all the filling falling into one corner of the bed. One particularly great thing about this option is how fantastic it is for allergy sufferers. If you’re wondering how to choose a duvet when you’re always struggling with dust mite sensitivity, then this extra hypoallergenic bedding could be a dream come true. What’s more, the Micro-fresh system prevents the build-up of dirt and bacteria which keeps beds fresher for longer. When you’re trying to keep warm in the winter, you want the type of duvet that’s going to wrap you in comfort all night long. However, the last thing you want during those warmer nights is a covering that’s not breathable enough. Fortunately, Simba Sleep thinks they may have found the solution with their Hybrid Duvet featuring “Outlast” technology. The Simba Outlast is a unique “phase changing” material that responds to the temperature in your room. If you get too warm, the hybrid duvet will absorb body heat to keep your temperature regulated. On the other hand, if the temperature in the room drops, the Simba duvet will release some of your body heat back into the bed to warm you up. 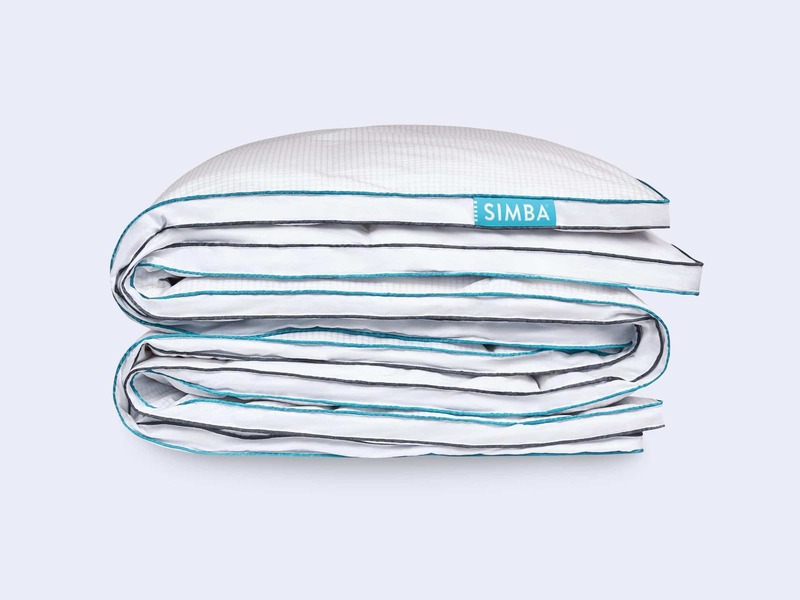 Unlike many of the down and feather duvets on the market, Simba’s Outlast option also comes with a soft-touch covering with 300 thread count cotton to keep you in the lap of luxury. Additionally, the filling is made of 90% down and 10% feathers. As any duvet buying guide will tell you, the more down, the better. When you’re choosing the best winter duvet for your needs, one of the most significant decisions you’ll need to make is what type of filling you like in your covering. The Woolroom deluxe wool duvet takes advantage of the natural warmth of wool to keep you cosy during even the coldest nights. The luxurious range from Woolroom is designed to keep you perfectly wrapped in the right temperature for as long as possible so that you can enjoy an uninterrupted night of sleep. This is a great duvet for snuggling in, made with British wool graded by the most discerning British merchants on the market. Wool is one of the best duvet filling options because it’s so versatile. The material draws heat away from your body during the summer and gives you extra warmth when you need it in winter. Intended to give you the ultimate all-season comfort, the Deluxe wool duvet can be changed according to the seasons, thanks to the combination of a lightweight tog, and a medium tog that joins to offer about 11-14 togs of warmth. 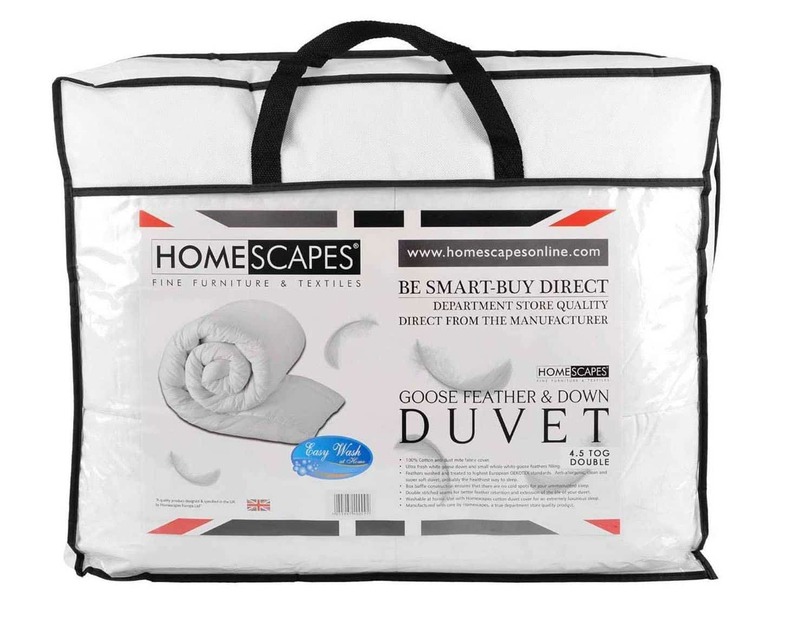 If you live in a particularly cold part of the UK, or you’re the kind of person who can’t stand feeling cold at night, then you’ll love the Homescapes White Duck Feather and Down duvet. 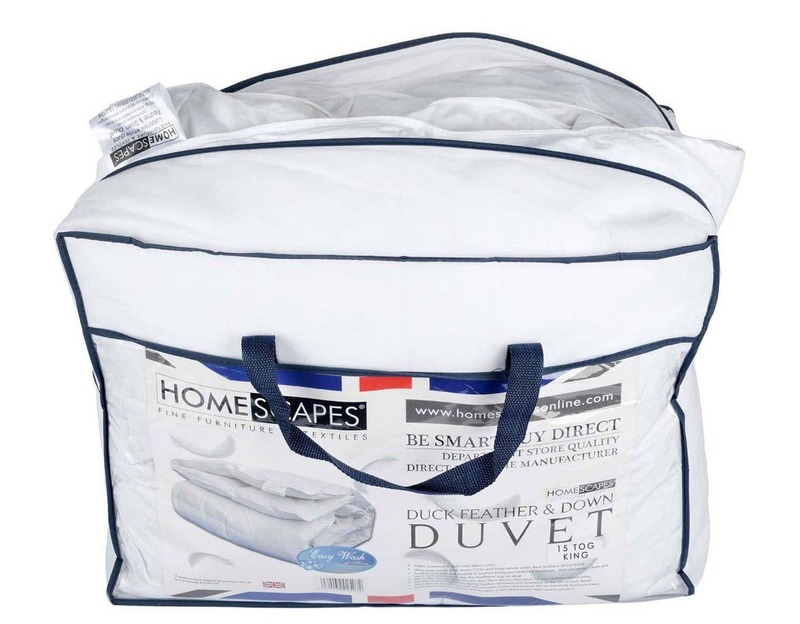 This high-quality duvet offers a whopping 15 togs of warmth – sure to be enough for any cold sleeper. If wondering how to choose a duvet for those snowy nights at the end of the year, this natural duvet could be one of the most luxurious options on the market. If you’re wondering “What duvets do hotels use?” you’ll usually find that “duck” down is more common than goose in the hospitality sector. This could mean that the Homescapes makes you feel like you’re sleeping at a high-quality hotel, instead of in your own home. It carefully encases its feathers and down into several small compartments, designed to distribute weight and warmth more easily. 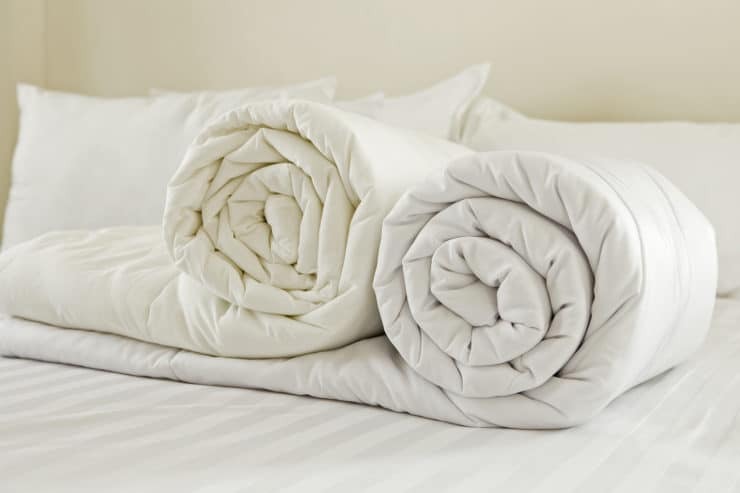 We wanted to include something for everyone in our buying guide, so we were sure to check out some of the best duvets reviews from people with allergies too. Though there are plenty of anti-allergy duvets on the market, you can’t get much better than buying a duvet made with materials that are naturally allergen-proof. The Fogarty Pure Wool Duvet takes advantage of wool’s anti-allergy nature to help you fight back against discomfort at night. The Fogarty automatically eliminates problems like dust mites, and bacteria so you’re less likely to wake up with bleary eyes and the sniffles. Wool is also a great temperature-regulating material, so you’ll find that it’s much easier to keep yourself and your partner comfortable through virtually any season of the year. 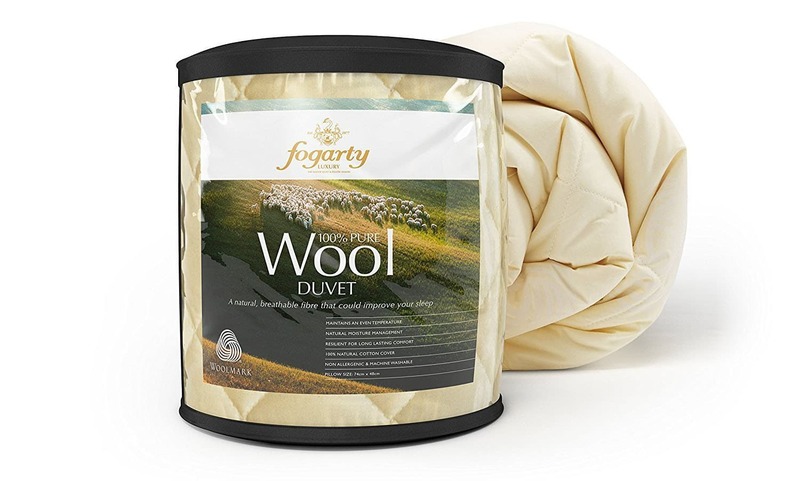 During those summer nights when you’re more likely to sweat, the Fogarty Pure Wool duvet has you covered with a highly-breathable structure, intended to wick away moisture as quickly as possible. You can even wash your duvet at home at 40 degrees Celsius. Feathers are easily one of the best duvet fillings around thanks to their natural ability to spread heat out across a surface and regulate temperature. The Soak and Sleep Duck Feather and Down duvet features a luxurious blend of 15% duck down, and 85% duck feather. 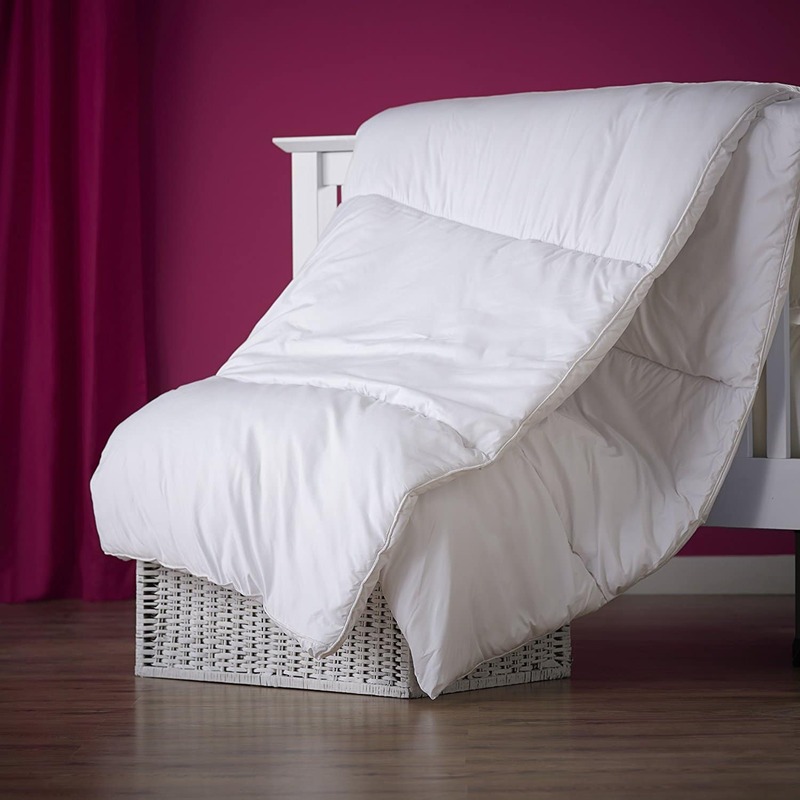 The duck feather helps to add bulk and comfort to the duvet, while the down is perfect for winter insulation. Soak and Sleep carefully wash their feathers before placing them into soft cotton casings to help enhance breathability while you sleep and reduce your risk of being poked and prodded during the night. This duck feather and down duvet comes at a 13.5 tog rating – ideal for the winter months when you need a little extra heat. One particularly great thing about this duvet is that although the tog is high for winter, the feathers make it very lightweight, so you don’t feel as though you’re being weighed down by your covers. Have you ever had a dream where someone’s sitting on your chest? That’s precisely what it can feel like trying to get to sleep underneath a winter-tog duvet during the summer months. 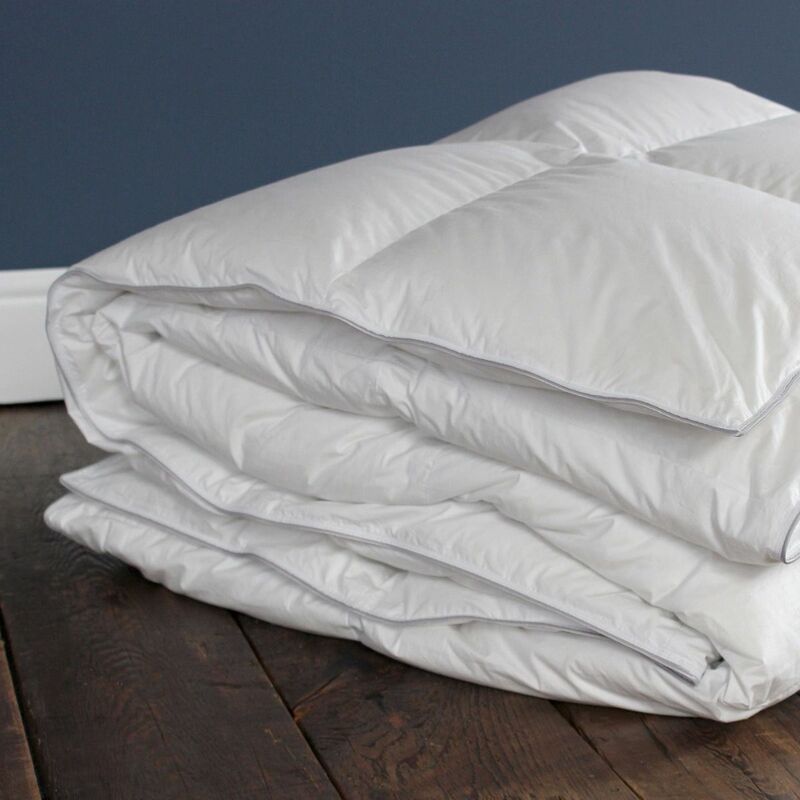 If you’re wondering “What duvets do hotels use for the warmer months?” then the answer is likely to be something like the Homescapes 4.5 tog Luxury white goose feather& down duvet. Though it’s designed to be as lightweight as possible, this 4.5 tog duvet is still generously filled with down and feathers, so you have something cosy to snuggle up to at night. As with the other duvets in the Homescapes range, the feathers in each duvet have been carefully boxed into individual compartments, so you don’t have to continually shake your duvet out before you use it each night. This extra lightweight duvet is also very easy to wash, so if you do find that you’re more likely to get sweaty during the summer months, you won’t have trouble keeping your duvet clean. One of the best duvets around for when you want to stay warm – without overheating, the Homescapes duvet is an excellent choice for couples and individuals alike. Some pockets seem “fuller” than others. While many people disagree on what makes for the best duvet filling, it’s hard to argue with the luxury of an Eiderdown cover. Eiderdown is a highly specialist form of down taken from Eider ducks, which breed in one of the harshest climates in the world. 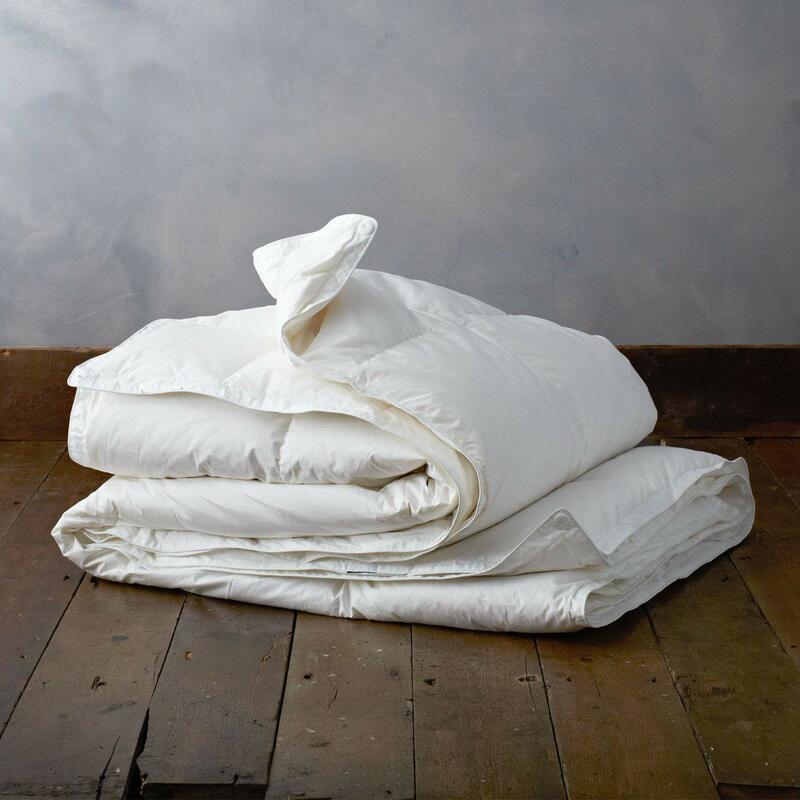 Simultaneously light and fluffy, while also wonderfully capable of managing temperature regulation, Eiderdown is unlike any other duvet filling on the planet. The Soak and Sleep Eiderdown quilt range is the perfect introduction to the wonders of Eiderdown. We included this item in our duvet buying guide for people who can’t afford to compromise on luxury. The Soak and Sleep down is painstakingly collected from fledged Eider nests throughout Iceland and placed into 320-count covers for your comfort. This is one of the most exclusive duvets that Soak and Sleep offer, and it’s designed to be fit for royalty. Perfect for all seasons of the year, Eiderdown adapts to suit the needs of your body temperature, so you’ll never get a better night’s sleep anywhere else. Now that we’ve covered the best duvet for people for whom money is no option let’s look at one that’s sure to suit any budget. The Slumberdown 3-in-1 duvet is made up of two separate quilts, one cosy 10.5 tog, and one 4.5 tog duvet to give you a 15-tog combination. If you don’t want the extra heat during certain months of the year, you can remove one duvet or the other to get your perfect balance of comfort. The Slumberdown duvet adheres perfectly to your body shape as you move during the night, keeping you comfortable for hours at a time. What’s more, it’s designed to be anti-allergenic, so you don’t have to worry about sniffling and sneezing all evening long. To make your life a little easier, Slumberdown designed their all-seasons duvet to be machine washable at 40 degrees Celsius, and you can even dry it in the tumble dryer! What’s more, the duvet is designed to fit British duvet covers, so you shouldn’t have to spend too much time searching for the right cover. Now that you’ve read our best duvet reviews, you’re probably wondering how to choose a duvet that’s right for you. When you’re picking the ultimate duvet, there are two crucial things you need to consider: the tog rating, and the kind of filling. Let’s look at both elements in closer detail. The “tog” rating on a duvet is a scientific measurement of the relative warmth of your quilt. Duvets are placed on plates in body temperature conditions and tracked to see whether they allow heat to be lost over a period. The scale of togs ranges all the way from 1 tog, all the way to the warmest tog rating of 18 togs. If you don’t have space to keep 3 different duvets in your bedroom for the different seasons, you can try an “all seasons” duvet. These duvets combine multiple quilts to help you create the perfect tog at different times of the year. For instance, you might have a 9 tog and 4.5 tog quilt that you can use individually during summer, spring and autumn, then combine for winter. Along with a tog rating, the filling is the other part of a quilt that you’ll need to consider when you’re choosing the right duvet. If a natural quilt is important to you, then you might consider looking at both down and feather. Down and feather quilts are usually very warm and durable. The higher ratio of down you have in your quilt, the lighter the duvet will be. However, remember that a light duvet doesn’t necessarily have to be cool – it just means you won’t feel weighed down during the night. Hungarian down is one of the most popular options on the market. However, if you’re looking for serious luxury, then you can also consider Eiderdown. Most duvet manufacturers consider Eiderdown to be a specialty, so you may have to order your duvet to be made for you. Another option for natural fillings is wool. Wool is a unique substance that’s perfect for regulating heat at all times of the year. When your body is cold, wool will remove moisture from your skin and trap warmth. On the other hand, when your body is warm, wool will help to spread your heat out and away from your body, while getting rid of excess sweat. If you’re wondering “what duvets do hotels use?” the answer is usually either feather duvets or synthetic quilts. Synthetic duvets use non-organic substances like microfibre to help keep you comfortable throughout the night. Microfibre often mimics the feeling of a down duvet, but it does flatten out much more quickly. Additionally, Hollowfibre is another option for a synthetic duvet. Hollowfibre maintains its structure and bounce for longer and feels more like wool than down. If you’re looking for a duvet that won’t irritate your allergies, hollowfibre may be a good choice. There are various elements of a bed that need to come together to give you the best possible night’s sleep. Even if you have the cosiest pillows and the best mattress, you’ll struggle to sleep well without a great duvet to keep your temperature regulated all night long. 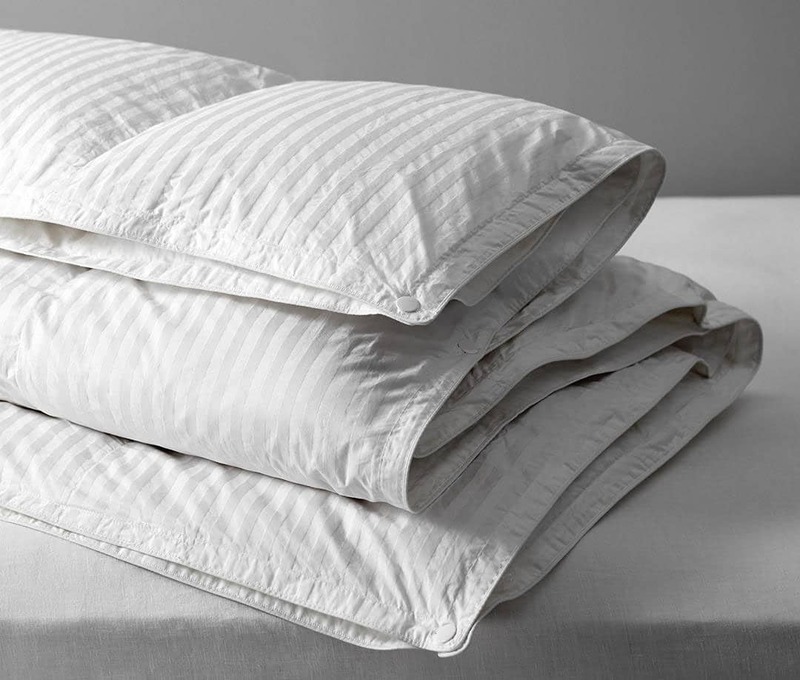 We love the White Company’s Hungarian goose down duvet for its luxurious feeling and its naturally breathable composition. Even if you’re not an extra-cold sleeper, you should be able to enjoy this duvet all year round without much trouble. Of course, if you’re looking for unbeatable luxury, it’s safe to say that you can’t go wrong with the Eiderdown duvet either. Of course, we think that Eiderdown may be a little too specialist for most consumers who don’t have the time to care for their duvet every week! What’s your idea of the best duvet? Let us know in the comments below, and as always – sweet dreams!